The Musical Event of the Spring is coming to Medford! 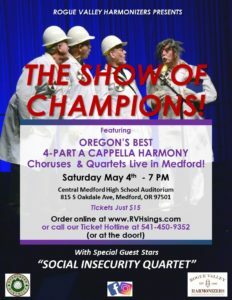 Oregon’s best a cappella in the barbershop style Choruses and Quartets will be competing during the day for the honor to sing on this amazing show! 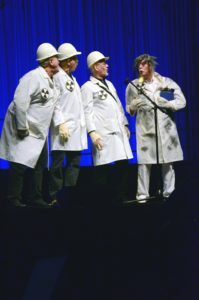 And fresh off of their triumphant performance at the Grand Ole Opry in Nashville, Tennessee the hilarious hijinks of SOCIAL INSECURITY QUARTET will headline the show! Online orders will be available at will call the night of the show. Tickets WILL NOT be mailed out in advance of the show. © 2019 Rogue Valley Harmonizers.